Forty-six Emirati philanthropists and ‘UAE Heroes’ were awarded and recognised for their achievements, at the UAE Pioneers Awards on Tuesday 28 november 2017. His Highness Sheikh Mohammed bin Rashid Al Maktoum, Vice-President and Prime Minister of the UAE and Ruler of Dubai, honoured the awardees, led by His Highness Sheikh Mohamed bin Zayed Al Nahyan, Crown Prince of Abu Dhabi and Deputy Supreme Commander of the UAE Armed Forces, at a lively ceremony held in the Capital. The ceremony marked the 46th National Day, as well as the Year of Giving 2017, announced by the President, His Highness Sheikh Khalifa bin Zayed Al Nahyan. 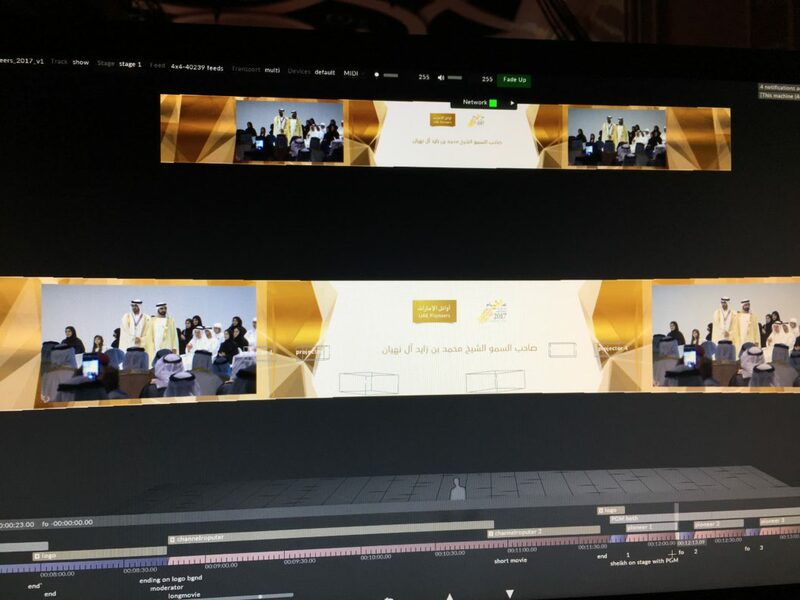 Filmmaster MEA has asked Visual Solutions for the 2nd consecutive year to be in charge of the 32m wide curved projection screen and the full playout and visualisation of the event. Using 6 projectors and 1 x d3 4×4 pro VFC, this was all in very good hands.